It is strongly recommended that you protect your work online from copyright infringement, by placing copyright notices to them. In this article, I'd like to just share on how to include a copyright notice to your blogs or web pages, one on every page will suffice. the statement (this is optional). An example of a simple cover all statement will be 'All rights reserved'. Well, the best way to add the copyright symbol to a web page is to use a HTML character entity. Just type the character entity name, &copy; (ampersand+copy+semi-colon) at the place where you want the copyright symbol to be. The other better and reliable alternative is to use the character entity number, &#169; (ampersand+#169+semi-colon). Tip: take note that some browsers may not support this character entity name, so best to use the entity number, &#169; instead. 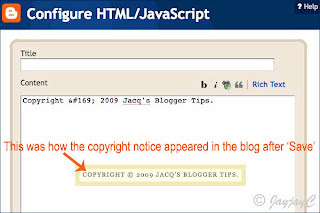 An example of the copyright notice to be typed is : Copyright &#169; 2009 Jacq's Blogger Tips. And, that will give the following display : Copyright © 2009 Jacq's Blogger Tips. Okay, next is to learn how to place the copyright notice at the bottom of your web page or blog's footer section. 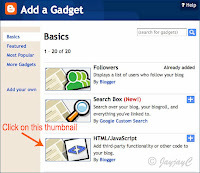 Blogger.com has made it so easy for us bloggers, with little or no technical knowledge. 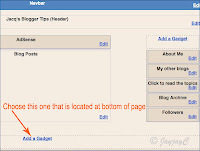 It can be done in 2 easy ways in Blogger's Layouts feature, either via the Page Elements tab or Edit HTML tab. Choose the former which is the easier way if you do not know much about HTML. Click Save and then View Blog. (Take note that font-size and text alignment of your created copyright notice is already catered for by your blog's template, though you can change them if you know the relevant html codes. Just click the related Page Element gadget to edit, if so desired). Click the Preview tab to have a look at the result. If satisfied, click the Save Template tab. Otherwise, click the Clear Edits tab and try again, probably to amend the HTML codes of font-size and text alignment or reposition the inserted text. Then, Preview again and if still unsatisfactory, Clear Edits and try again. Finally click the Save Template tab when all is done. I'm not an expert on HTML, but one who aspires to improve, and having tried it out on 3 of my Blogger blogs, thought it best to record my experience here so that others may benefit. Copyright Notice fact sheet from UK Copyright Service. Go on...add a copyright notice to your blog! It's really simple! Jacqueline, just to let you know, I now know how to put the copyright symbol, thanks to your tips. I have been trying to figure the out for a long long time how to type this into my photos. It is very a useful symbol to have. Now I can do it already! Thank you very much. Thanks for sharing your success, I'm happy for you, Autumn Belle! The pleasure is all mine...I do really enjoy sharing my knowledge! Thank you so much for the concise, helpful information. I was able to add the copyright symbol to my blog. You're most welcome, Angela! Delighted to know the tutorial helped you. Thanks for the information. I spent some time looking how to do this and you had the easiest explanation I cound find. Hi Jacqueline, thanks to you, I now have a copyright symbol on my blog! And to think I was curious and irritated to see that symbol on the other blogs before. Do you mind me adding your link at my blog, so that other bloggers might benefit from you? You're welcome...I'm happy for you, happydaily! Go ahead and add the link, after all the tips are to be shared worldwide. Thanks, I appreciate your thoughtful gesture. So happy for you, Sri Vidya! And thanks for showing your appreciation in your kind comments. My pleasure, Avinash! Glad you've found it helpful. Jacqueline , thanks for your post. I 'm going to implement this in my blog. You're most welcome, Ardhendu De! Great to know that! Thanks for your appreciation, Melissa! You're most welcome, Toni Watts! Thanks for positive feedback...much appreciated. Thank you so much for the copyright tips. The directions were super easy to follow and I just added my copyright notice to my blog! Thanks for your thanks and positive thoughts, ladymoxie! Glad you're happy with the new addition. I appreciate your clear directions; thanks for helping out! Thank you very much for the excellent tutorial. I just put it on my bloggs. Thank you for the excellent instructions! Thanks for the lovely compliment, Sevilay! Much appreciated. As simple as this sounds, I can't located outer-wrapper or footer-wrapper even after expanding the widget template. I want to insert my copyright and My Live Signature at the end of each blog post but have had no luck in trying to do so. I just switched my Blogger to a new template, and of course, I didn't back up the original ;( Any help would be appreciated, thank you!! I saw that all's well at your blog now, Connie. That's great! Thanks for the post! This was very helpful. You're most welcome, Jessica. Thanks for your positive comment. Thanks for your appreciation... I love sharing, Telefan! Hello, I did everything like you said, but it's not showing up when I hit preview. :( I deleted the attribution earlier, so could that be why? Please help as I really want to add the copyright notice at the bottom. Elinka, I'd suggest that you choose option A as described in the above tutorial, that is, by going to Layout and Add a Gadget at the footer section. This is easier than option B where you need to edit your template's html. Thank you for the information... I've been looking for this information all morning, and so far this is the only place I've located it. Got my copyright notice posted now using the HTML option. Thanks again! You're most welcome. Great to know you've got what you desired, Missphoenix! You're most welcome, nukes&knives. Thanks for your much appreciated positive comment! I'm delighted to know you're happy with the result and appreciate you taking the trouble to pen your kind thoughts. Thanks a lot! :) Simple and clearly explained. Thank you for your thanks and appreciation, Torque. Thanks to you I've added a copyright to my blog and I was able to add an archive page based on your tips. Very helpful site one of the best and very easy to follow. How can i follow you? Help! Just scroll right down to the footer section where the icon of all my site followers are displayed. Then just above them at the left corner you'll see a link 'Join the site' with the Google Friend Connect icon. Click on it and a window pops up... then follow through instructions to sign in. Thank you very much, I was searching for this and finally I got it. going to book mark this page. thanks one again. So sorry, Iqbal... I'm unable to help as it's out of my league. Jacqueline, can I get ur private e-mail ID? Sorry, Ajay... I don't give private tutoring. Kindly explore all my tutorials at Archives Page which may help your blogging doubts. Aman Sarda... I'd suggest that you choose option A as described in the above tutorial, that is, by going to Layout and Add a Gadget at the footer section. This is easier than option B where you need to edit your template's html. You're most welcome. Happy blogging! Hey, how did you add links to the copyright bar, like home about sitemap, etc? can you please help me do that? Hi Fiction Park. 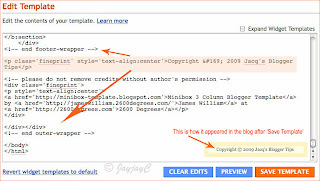 Edit your copyright widget at Layout, and add the related HTML links you desire with a space between each link. Check my tutorial on how to create such links. Hope this helps. You're most welcome, Rhoderick. Great to know you've found it useful. Have a nice day. Nice to know you've found it helpful. Thanks for the encouragement, Kryzzaesumaoang!